To have peace of mind, I recommend that you are using an up-to-date anti-virus software on your computer (so do I!). Unzip it and install it wherever you want. To check a site, click the toolbar icon on the left and enter a WWW address. If the address finishes with a directory name, don't forget to put a / at the end or you will possibly get the whole parent directory spidered. You can also click the "browse" button to check a local HTML file. If you do not already use IE for browsing and are sitting behind a company firewall, don't forget to configure your proxy before you start. If you are using a personal firewall (like ZoneAlarm or Outpost) you must enable Microsoft Internet Explorer by starting it, entering a URL and then "allowing" the application (you may also have to enable Xenu - see example for Norton Intenet Security). To find out what the software can do, simply try out the menu choices, the toolbar and the right mouse key. Or read this third-party manual, a bigger third-party manual with many pictures, a third-party report (How I check over 6,000 links every seven to ten days), a blog post by a SEO guy, or deutsche Beschreibung und noch eine, guide en français, nederlandse beschrijving, descripción en español, русское описание, Український опис, Beskrivelse på dansk, opis w języku polskim, opis na Srpsko-Hrvatskom jeziku. Good luck! If you find the software useful, please click here. Join the Update Announcements mailing list at Yahoo Groups! To subscribe, send an empty e-mail to linksleuthupdates-subscribe@yahoogroups.com. You can also join the user group by sending an e-mail to xenu-usergroup-subscribe@yahoogroups.com. 2. Is Xenu's Link Sleuth (TM) better than Incontext WebAnalyzer? Incontext WebAnalyzer is no longer available since February 2002 and hadn't been updated for years, so this is more a historical note. The "broken links view" shows only broken links; In WebAnalyzer you'd have to press the button again and again as the window fills with crap. While Xenu does not offer an "update" facility (which doesn't work anyway), it has a "recheck broken links" function that works fine. It is small, written by one person experienced in Windows software development since 1993 and who works as a professional software developer since 1983. This means that bugs will be corrected quickly. This is a matter of honour. The report can be viewed easily, even when you have long URLs. 3. Is Xenu better than a web-based service? There's a free WWW based service called "LinkTiger" which looks pretty nice, although it isn't free, except for a 100 links (As of October 2010). Their web page is very nicely designed and made me think about whether (in general, not related to LinkTiger or Xenu) such a solution is better or not. Audisto.com (as of June 2013 it was known as strucr.com) is also interesting (One of the founders invited me into a restaurant and we had a very nice talk). Audisto.com focuses on "the big picture" with websites. Not so much just finding broken links (it does not check external links), but find URLs that could be a problem for SEO, or find certain common HTML problems. Their target are big, really big websites (several millions of urls), where the web team has lost the understanding about what is going on. Sadly they no longer have free subscriptions (see pricing). Any more ideas pro or contra one of the two solutions? Contact me. (If you want to report a bug, click here). 4. Can I support the author? 5. Why does Xenu's Link Sleuth (TM) report http://www.site.com/../page/index.html as broken? The key is the "../" part. It means you have e.g. a top level page that links to a page in a directory above, which doesn't exist. It is true that Mozilla will not have any problems with such a page; but I am less tolerant. 6. How can I configure a proxy? You can configure a proxy in the control application of Windows. Double-Click on the "internet" symbol, then click on the "card" of the dialog box that is named "Connection". You may need a proxy if you are sitting "behind a firewall". This is usually so in big corporate networks. One user with Windows 2000 always had a timeout, he solved it by checking "Use HTTP 1.1" and also "Use HTTP 1.1 through proxy connections" in the "Advanced" tab of the Internet Options in the control panel. However, this may not work for everyone, because some web servers do not support HTTP 1.1. 7. Why does Xenu's Link Sleuth(TM) report a URL with a space in it? Either because you do have a space in the URL, or because you have a carriage return / newline in it. Although Mozilla tolerates this, I do not. 8. I use Mozilla 3.0 Gold and can't get rid of file: URLs for images. What can I do? Re-edit the page, double-click on the picture, remove file: from the picture location and take care to uncheck "copy image to document's location" in the "properties" dialog box (at the bottom left) before you save and exit the dialog box. 9. What is the maximum number of URLs that can be checked? There is no fixed number, but it seems to be above one million. The problem is that Windows XP applications have a size of 2GB max. A 64 bit beta version is available which may or may not allow more URLs. Just unpack the ZIP file and move the XENU.EXE and ZLIBWAPI.DLL files at the place where you have the XENU.EXE file currently (rename the old XENU.EXE file first to save it). The new one is based on Microsoft Visual Studio 2010. The 64 bit EXE file is about 10 times as big as the 32 bit version that is based on the good old Visual Studio 1998. Microsoft has confirmed the problem. 10. Can the software check my site locally? Since september 1998 (1.0n), you can do so without a local web server (your address would then be http://127.0.0.1). Use the "Browse" button in the "New" dialog box. Sometimes you'll get "error 3". It happens because the WININET.DLL is unable to handle directories, i.e. links that end with "/". You can avoid this by linking to the actual "main file", usually index.html or default.html. That your browser can handle local directories and display them nicely, is because he does additional work, which I do not. Mixups of higher/lower case characters in links won't be found, since Windows does not make a difference. But UNIX does! The main reason that you still need to make occasional "remote" checks is because you might have forgotten to upload your files to your WWW server. 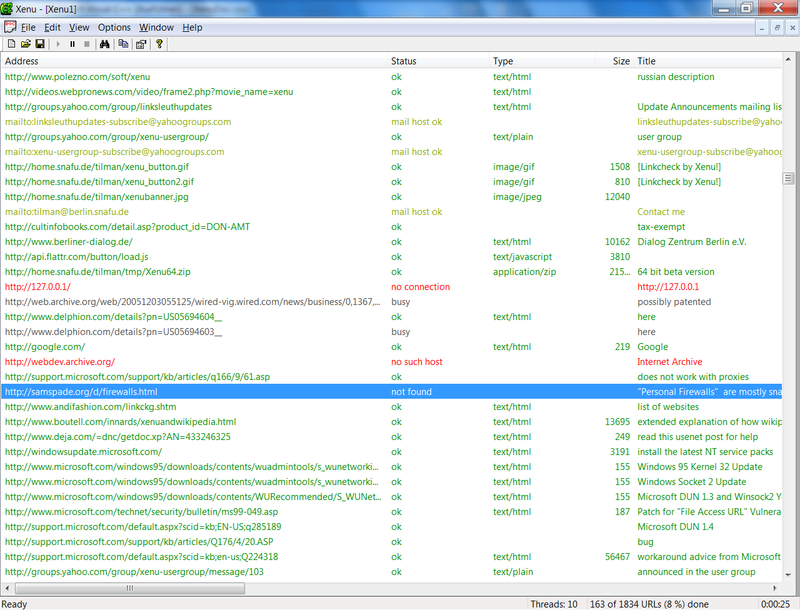 A user of IE 4.0 reported that when not online, the software checks every "remote" URL like a local file. This is a problem of the newer version of the WININET.DLL; the version with IE 3.0 reports "no connection" or "no such host" instead, which is more logical. 11. Does it work on Windows NT 3.51? One user said it worked fine after he copied a version of WININET.DLL from a Windows 95 system standing nearby, and put it into the directory where Xenu's Link Sleuth(TM) was installed. 12. How is it so damn fast? Because it uses a (possibly patented, see patents here and here) technique known as preemptive multithreading. It means that the link checking software retrieves several web pages at the same time; the competition uses the same technique. The maximum count of threads is initially set to 30, but you can configure it to any number between 1 and 100. A number that is too high might result in failed connections or in timeouts, which means you will have to recheck the broken links. At the time I had a dial-up connection, I got good results with 70. Now I have a DSL connection, and I have to set the number to 1-5. I suspect that my DSL provider has installed a brake somewhere to prevent "commercial" customers from using the unexpensive "private" service. 13. Can I have the source code? 14. Can I buy the source code? Sure, make me "an offer I can't refuse". 15. Just for fun, I checked Tilman's web site, and found many broken links. Why? Links that I know to be broken: I keep them like that to remind me to find these people some day. The web page itself has a notice that the link is broken. Temporary unreachable hosts: these are temporary routing errors. Really broken links: I will usually correct the link or remove it within the next few days. 16. How do I correct broken links? Repairing broken links (i.e. getting the correct ones) is a difficult task that takes time, but with experience, you'll get it done faster and faster. if you have the e-mail address of the site owner (because you know him), try an e-mail. Sometimes the address still works, even if the web site is gone. find the home page of the site you link to, to see if the site has a "sorry we moved" message. If you linked to http://www.host.com/user/page888.html and this is broken, look at http://www.host.com/user/ to see if there is a message, or to see if the site has been reorganized. Some sites reorganize their user pages differently, e.g. http://www.host.com/homepages/users/page888.html. Sometimes the web switches changes between the two methods. Other sites are owned by the user himself, e.g. www.user.com, so the home page is the root page. If the site exists but you cannot find your page, send an e-mail to the owner. use search engines to find the site or the name of the site owner (if you know). To find where the site is, use web search engines (like Google or the Internet Archive) and usenet search engines (like Google Groups). post a message in a newsgroup that deals with the topic. Hopefully the site owner or one of his friends reads the messages there. if you are still unsuccessful, either delete your link to the site or repeat your attempts after a month (some sites might reappear in a search engine after some time). Sometimes it happens that a host is reorganizing its hard disk, and all user pages get back within a few days. 17. What about ftp and gopher sites? Starting with version 1.0k I have implemented a new ftp checking method that is 100% reliable. Sadly, this method does not work with proxies. The previous method I used (and still use for gopher) was unreliable, as it did not detect certain errors. The method for checking gopher sites is still unreliable. When an ftp or gopher site is accessed through a proxy, this proxy builds up a web page. Sadly, it doesn't always bring up the information whether the URL exists or not. When you access a gopher site without a proxy, it brings an error message, but not an error code. This seems to be a bug of the OpenURL() function of WININET.DLL. The output lists ftp and gopher sites as links, which allows you to make a manual check of these sites. 18. Why can't I launch URLs? Starting with version 1.0g (Christmas 1997), URLs are launched with DDE ("dynamic data exchange", a windows method of communication between applications), to open many browser windows but to prevent the opening of several Netscape applications. This is done with the help of the Registry, by searching for HKEY_CLASSES_ROOT\http\shell\open. This has the path for the browser, the DDE application name (e.g. "Netscape", "IExplore"), the DDE topic (usually "WWW_OpenURL"), and a template for the DDE item (usually "%1"). If you cannot launch a URL, do not panic - export and e-mail me the segment of your registry (start REGEDIT.EXE, and search for "http"). Additionally, send me the file XENULOG.TXT which you will find in your %TEMP% directory. The cause is usually that you have not installed your browser properly (maybe you just transferred the files from another computer). Solution: update or reinstall your browser. Starting with version 1.1b, I have stopped displaying an error message when the registry is incomplete, because there were too many complaints. Instead, the browser will simply be launched with the page. This has the disadvantage that the page won't be displayed in an extra window of the current active browser application. One user with Microsoft Vista 64 (UAC disabled) was unable to launch URLs (message box: "Unable to open browser for 'URL': error 5: Access is denied"). The cause was COMODO Firewall Pro 3.0.25.378. Without the firewall, it worked fine. Please remember that "Personal Firewalls" are mostly snake-oil. Set up an external firewall box instead - this is usually included in your router. 18a. Why does the browser not open a new window? This is a problem with Microsoft Internet Explorer. Open your registry and search for HKEY_CLASSES_ROOT\http\shell\open\ddeexec. If the key value is "%1",,-1,0,,,, then change it to "%1",,0,0,,,, (i.e. you change the -1 to 0). 18b. Why does Link Sleuth freeze when launching the report? If Link Sleuth freezes when launching the report, but not when double-clicking on a URL, the reason might be the site map. A site map can be HUGE if the site goes very "deep" (high level, see the "level" column in the Link Sleuth window). A very "deep" site can happen if you have a forum. Solution: disable the site map in the options dialog, or exclude the "deep" parts of your website (e.g. a forum) in the initial dialog box. Version 1.3 has an abort dialog. 18c. Why does Link Sleuth freeze when launching the report or a URL? The only disadvantage is that it will not open a new window in the browser. By default, cookies are disabled, and Xenu rejects all cookies. then you can enable the cookies in the advanced options dialog. You should not use this option if you have links that delete data, e.g. a database or a shop - you are risking data loss!!! 20. Why are some links reported as "broken" by Xenu, that can be displayed within my browser? Some servers read the "User Agent", i.e. the name of the software that tries to access a website. Some websites allow only browsers, some even only Microsoft Internet Explorer, and refuse everything else. Some may even specifically refuse Xenu because of past misuse. Andi has a list of websites that deny access to Xenu. Tom Boutell has an extended explanation of how wikipedia denies access. A user-configurable "User Agent" would be the solution, but this would make abuse possible. 21. Why can't I connect to "secure" (https) sites ? If you have set your proxy correctly, try to connect with IE. If this doesn't work, read this usenet post for help. If this still doesn't work and you use Windows NT 4.0, install the latest NT service packs (up to SP5). 22. Any known problems with Windows 95? One guy had problems with the WININET.DLL (v. 4.70.1300) installed with OEM Windows 95 (v. 95 4.00.950 C). Changing to version 4.70.1335 solved the problem. 23. Any known problems with Windows 2000? Windows 2000 automatically sets a configuration option to use HTTP 1.1 for connecting to web sites. Many, many web sites do not use that version but continue to use HTTP 1.0, so the automatic setting may prevent connections. This is the reason why Xenu would not run for me. When I disabled that setting, Xenu performed properly. 24. Can I configure the timeout? Enter the number of seconds in the [Options] segment in XENU.INI, e.g. as timeout=120. The default value is 60. Note that this isn't "perfect". Microsoft Windows has a bug so that the timeout can't be set the way it should. I am using a workaround advice from Microsoft. However I have observed that it doesn't work if the timeout "hits" while trying to find out if a host name exists. In the example above, the substring within the first (....) must contain the valid URL. Frank Visser has also written a better description on his site. 26. What about passwords entered in a FORM? If the server accepts authentication with GET (might work with the Tomcat server), try sending such a URL. However, you might still have to activate cookies. I came up with a new solution for this problem, please give me feedback if it works or if it doesn't. It was first presented in the user group in April 2009. Submitting a FORM was never a technical problem for me; I have tested this years ago already, but without any user interface. My mistake was to look for a general way to catch FORMs in HTML pages, instead of just using the login FORM url as a start. I found a somewhat practicable solution at a competing site (WLV). The initial dialogbox has a new checkbox for POST and a POST query string. Note that the query string won't be stored in the INI file. Don't let Xenu hit any URLs that delete or change something! 27. How about a WAP version? Xenu does check .wml files since February 2001. 28. What about these error codes? I identify only a subset of all possible error codes in the "Status" column. If you get an unknown error code in the Xenu application window, you can scroll to the right for an explanation text. 29. Why do I get broken links with filelist.xml, editdata.mso and oledata.mso? You can also get rid of the problem by excluding them in the advanced options dialog. 30. Why do I get "file not found" on remote checks? Your Internet Explorer isn't working properly, or is in offline mode, or is blocked by your firewall. Enter the URL you want to check into IE and see if it works. One user got it working by starting Internet Explorer first, and then starting Xenu. I believe that the cause is a broken setup of Windows, or of Internet Explorer. Your temporary directory is full: enter %TEMP% (not "c:\temp" !) into the Windows Explorer, check if there are many TGH*. * files, and delete them. 31. Can I make a foreign language version? No, please don't. There's no guarantee that any of the message texts will be kept in the next version. The other problem is that I didn't write the software in a way to be language-independent. I could have done it - but I think most people on the web do understand english. 32. Why isn't Xenu detecting missing URLs? A web server should return HTTP error 404 for non-existant URLs. Some servers are poorly configured: some redirect to an existing URL with an error message (bad! ), others do show an error page, but the server doesn't return the 404 error (very bad!). <% Response.Status = "404 Not Found"
The Apache web server has a different (and better) method of doing the same thing using native HTML code for the webpage. You simply set the correct config items in the http.conf file on your box. Now he gets a correct 404 error code which includes a tailored error page and no redirection. He read about it here. Settings for - "Home (Active)"
This is difficult to answer. The cause might be network overload; it might help to set a lower amount of threads, or to fine-tune the DoS detection of your firewall. Check your firewall logs to see whether it detected a "SYN flood" DoS attack by you. SYN is the first data packet that is sent to a host when starting a connection. Theoretically, Xenu might send up to 100 SYN packets that are not immediately answered, so a firewall (that counts "unanswered" SYN packets) might think something "evil" is going on. My firewall box once claimed to have detected a SYN flood when I opened many newspaper articles in background browser windows. 35. Any Spyware, Adware, Malware? This software exists since 1997 and never had any type of malware. It does not "phone home" or return any statistics to me. There are random "ads" in the HTML report for causes I support; however I don't get paid for this. Any passwords that you enter in the software (e.g. for orphan search) are not "remembered" after you close Xenu, nor are they passed to me. Some debug output is stored in the file XENULOG.TXT which you will find in your %TEMP% directory. That file does not contain any passwords and it is used for support (I will sometimes ask you to attach it to an e-mail to me), primarly for problems with the launch of URLs in your browser (especially the report). The file is human-readable, so feel free to have a look. The file is not sent to me by Xenu, it just remains there and you can delete it if you wish. Here's a green review by McAfee Siteadvisor about Xenu's Link Sleuth. Note that until before July 11 2008, Yahoo Search (which uses input from McAfee SiteAdvisor) was redflagging every URL of the whole snafu.de domain, including my user site (this seems to have been corrected now). McAfee SiteAdvisor has redflagged the snafu.de domain, but not the user pages. This was related to three downloads (CuteFTP, GoZilla and Nok2Phone) on the customer support ftp site of snafu.de, who has been my ISP for over a decade. These downloads have been removed since then and both Yahoo and McAfee have been notified. On July 30 2008, I noticed that the snafu.de domain has been greenflagged. As of 22.8.2009, I was told by a user that Trend Micro Internet Security was redflagging this web page as "Dangerous", because Xenu is a "generic trojan". Such false positives are not an isolated problem, other people have had the same complaint. On August 27 I talked on the phone with a very friendly human from Trend Micro. He explained to me that his software wrongly considers mine to be "another antivirus software" because "it searches" (sure it does! ), and that he installed the software on a test machine and understand it is harmless. He promised to "contact the lab". But after that, I was asked to make another support message on another web page, and nothing happened after that, but I haven't had complaints from any more Trend Micro users since then. As of 30.10.2009, a McAfee Antivirus product claimed that my product is a "Trojan - Artemis". (McAfee describes this problem: "Artemis" & Other Possibly False Detections) After several complaints, it seemed that the problem had been solved with version 5836 (tested 18.12.2009). As of 21.6.2010, McAfee did it again with the new version 1.3.7, and later with 1.3.8. Despite contacting them, there was no reaction. After finding a different contact page for false alarms, McAfee contacted me the next day (on 14.10.2010) and told me that the false Artemis detection had been removed. On 21.11.2010, a user of Avira Webguard told me that my download URL was blocked. I found out that it was not blocked by the free antivurus product. After a complaint, it was unblocked two days later. To put any such "alerts" into the correct perspective, upload any Xenu.exe file to www.virustotal.com, which will check the file against 30 antivirus products. I'm not the only one "suffering" from this type of libel. Read this blog post by nirsoft.net Antivirus companies cause a big headache to small developers, or this blog by Bill Pytlovany McAfee Continues to Harm WinPatrol Users. This SARVAM blog entry shows that many AV products consider windows system files to be malware when packed. If you have any more questions about security, don't hesitate to contact me. If you want to report a bug, click here. 36. How about wildcards in the inclusion and exclusion lists? This is available but not in the general version. Download it here, however, this may not always be the latest version. Just enter something with a "*" instead of an URL, e.g. "*print*" to exclude an "easy print" version of a web page. Note that only "*" is supported; "?" is not, nor are "regular expressions" (because an average user won't understand the concept). Also, don't forget the "*" at the beginning and the end of the URL, unless you want the expression to be a prefix or a suffix. Styles and CSS files has been supported since version 1.3.8. Attention: Similar to HTML URLs, the CSS URLs must be "internal" to the root URL, or be added to the inclusion list in the initial dialogbox. For example, if your root URL is http://www.host.com/stuff/ and your CSS URL is http://www.host.com/css/standard.css, then it won't work - you should then add http://www.host.com/css to the inclusion list. One user complained that the software was using up all windows handles (32000) on Windows 7 32 bit, and after that he kept getting "no connection". The same happened with browser access. The user told me that it was a new PC. I warned him that new PCs often have some stuff pre-installed. The cause was Norton Security Scan. After deinstalling it, Xenu ran smoothly with 300-600 handles. Apparently, this product isn't just a scanner, but also a "live watcher", and the product doesn't free its resources properly. 39. Why are there changing Session-IDs? Xenu has cookies disabled by default. Thus, if the web server tracks sessions, this would have to be done through the URL. If the session ID constantly changes, then it means your application or your server software is buggy. A properly programmed server does URL rewriting automatically when needed. To prevent having a new session generated for each new URL, all internal links must be generated dynamically. In Java servlets, this is done with HttpServletResponse.encodeURL(), which will either change the URL or leave it as it is, depending on wether cookies are enabled or not. If you use .php, you should use the SID constant. The manual explains how. There is a problem with hebrew websites that happens only on computers with hebrew windows, if the character ת (tav - looks somewhat like PI) is used in URLs. This should be converted to %D7%AA, but is converted into %D7%D7 instead, and only in Israel and not "here" (in Germany). A fix will be in version 1.3.9. If you can't wait, use the current beta. Thanks, Yosi! If you are using an external authentication server (e.g. "Sun Access Manager"), make sure that when successful, it doesn't redirect to an URL that has already been checked by Xenu (and is the one that redirected to the authentication server URL in the first place!). Alternatively, use the authentication URL (e.g. http://auth.host.com/blah/blahRedirect_WL.jsp?goto=http%3A%2F%2Fwww.host.com%2F.wlforward) as the root URL, and include the "real" root URL (here: http://www.host.com) in the initial dialog box. I experienced this myself - the cause was a deadlock in log4j. Log4j is usually great, but deadlocks can happen "by design", see this long running ticket and this blog post. The proof that log4j was the cause is that it didn't happen when logging was set to OFF. One cause were two JSF Beans that were not serializable. Another was an error message by tomcat about an aborted GET access on /Context/faces/javax.faces.resource/jsf.js?ln=javax.faces". The later cause has been removed in 1.3.9. 43. Why does my page not have any outgoing links? The URL is considered external. Note that http://www.host.com is external to http://host.com and vice-versa. A page is delivered to Xenu differently than to a browser. That, too, can be investigated with Fiddler. A page is in 16 bit Unicode (utf-16, which has 2 bytes per character). Xenu does not support this. It is highly unusual, but not illegal. In firefox, you can click on a page with the right mouse key and choose "view page info". If it mentions utf-16, use NOTEPAD to save your page to a different charset (ansi or utf-8). Your page will also have about half the size than before. The software works pretty well, but here the list of things that shouldn't be. If you find another bug, e-mail me a description, please include the URL you are checking, and if possible try to save your work in a .XEN file and attach it (If it is larger than 1 MB, ZIP it first). Also check http://windowsupdate.microsoft.com to make sure that your system has all the updates. If you want to e-mail a suggestion, click here. You can also join the user group by sending an e-mail to xenu-usergroup-subscribe@yahoogroups.com. What about identifying how many steps it takes to reach a particular page from the home page and how much kb had to be downloaded before one could reach there. Your suggestions: e-mail me also if there is something of the above you'd like to have, and persuade me to do it. If you want to report a bug, click here. In April and May 1997 my employer assigned me on an out-of-town job, because another department needed a guy with MFC experience. So from monday to friday I was away, and on the evenings I was bored to death. Every week-end I was back home, and I usually checked my web site for broken links with WebAnalyzer. Sadly the software had a lot of bugs, and their support was ignoring my e-mails, and I was mad as hell, as I had spent quite a lot of money on a product that wasn't worth it. My job was also the first contact with VC++ 4.2 (previously I had only worked with VC++ 1.5, because our customers have a lot of 16bit systems), which had some easy-to-use Internet access classes. I had already experience with WINSOCK programming, but these classes would spare me a lot of time evaluating HTTP result headers and other annoying stuff. On an evening after an excellent italian food with a good chianti I took some hotel letter paper and wrote down a concept for checking links. A month later I took some time to install the development software on my computer and started working, with the help of that hotel-room concept. The work was done on some evenings, but mostly on week-ends, when I had more time. The application is written in Visual C++, and uses the MFC classes as much as possible: CDocument, CView, CListView, CObArray, CMapStringToOb, CArchive, CInternetSession, CHttpFile, etc, etc. That saved me a lot of time! Original icons in EXE file: Martin Hunt and Paul Campbell; Icon on web page: Erik Plummer; Idea to use banners in report: Marc Cross; Xenu logo button: Fred C.; second Xenu logo button: Charles A. Upsdell; Volcano animated cursor: Juan C. Pradas-Bergnes; Idea & help with SMTP integration: Mark Findlay; SMTP class: P.J. Naughter; Xenu artwork: William C. Chenoweth; WinHelp version of documentation: Andrew Schoenhofer; Regular Expressions: Henry Spencer and Guy Gascoigne; Install and deinstall: Inno Setup NSIS with help from Andrey Aleksanyants; help with Xenu banner: Bruno Zacke; wildcards: Jack Handy; sort icons for list columns: Thomas Holte; new Xenu icon in May 2008: Dominic Raths of Hitflip.de; Idea and code for GraphViz: Kevin Niehage; Current HTML Help (CHM) version of documentation: Andrey Aleksanyants; .jar listing: Arcangelo Bruna; Resize Dialog: Torben B. Haagh; Help with "the Hebrew problem": Yosi; Internationalising Domain Name conversion: Gisle Vanem and Adam M. Costello; duplicate content detection: RSA Data Security, Inc. MD5 Message-Digest Algorithm; gzip content decompression: zlib; sitemap tree css: Ross Angus. The study: Broken Links: Just How Rapidly Do Science Education Hyperlinks Go Extinct? Xenu, Xenu's Link Sleuth and Link Sleuth are trademarks used by Tilman Hausherr for software products and services. These products are not associated in any way with services licensed by RTC, CoST, BPI, CSI, etc.